Welcome to the Silverpick Lodge near Purgatory Ski Resort. 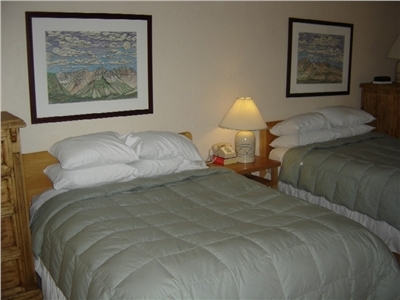 They are a 13 room Rocky Mountain Ski Lodge with 23 adjacent one and two bedroom condominiums. They sit at 8776 feet in the San Juan National Forest nestled under the 1500 foot Hermosa Cliffs and across the street from the Weminuche Wilderness, Colorado's largest. They are located on the San Juan Scenic Skyway, US HWY 550, halfway between Durango and Silverton, Colorado and one mile south of the lifts at Purgatory. Luxury at its finest for larger groups, weddings and family reunions. 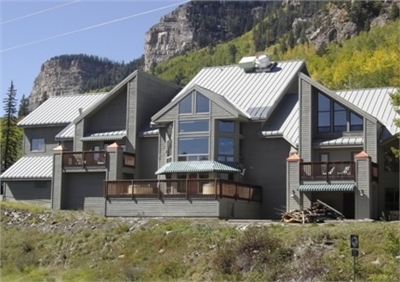 The Silverpick Lodge at Durango Mountain Resort is a 13 room Ski Lodge with 23 adjacent one and two bedroom condominiums. 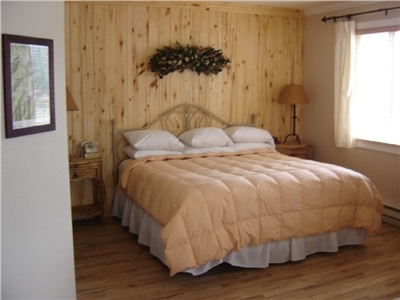 Silverpick offers prime mountain accommodations with Lodge Rooms that are clean and cozy with goose down comforters, feather beds and down pillows. 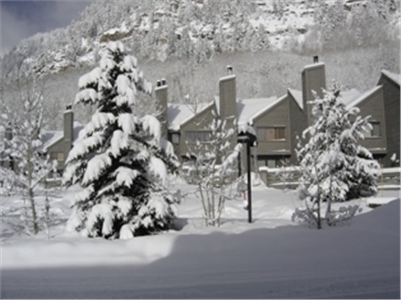 The Condominiums & Townhomes are the best on the mountain, just ask anyone who’s been there. Lodge rooms are named after prominent peaks in the San Juan Range and each features an original pencil drawing of it’s namesake by renowned local artist Howie Basley. In the Lodge, you will enjoy a small Spa that includes two Hot Tubs, a Steam Room, a Sauna, and a Massage Room and there is another Hot Tub outside in the Condominium complex. They also offer a free continental breakfast consisting of gourmet coffee, OJ, apples, oranges and bagels with cream cheese, butter and jam. In the basement there is a game room with free pool and Foosball tables as well as vintage video games and a Laundromat with a folding table, iron and ironing board. On the same floor, there is a 1500 square foot multi-purpose room with kitchen facilities that is ideal for small conferences, prayer meetings, family reunions, dances and parties. Also, the lobby features a 5,000 book library for your reading pleasure. 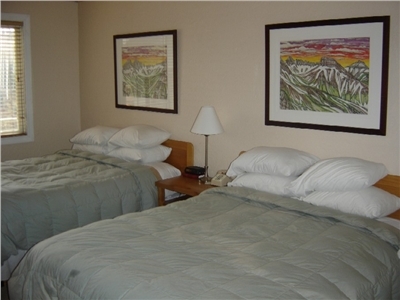 The Silverpick maintains strict cleanliness and repair standards in all of their rooms, condos, and townhomes. The Silverpick Lodge sits at 8776.66 ft, set in the San Juan National Forest and nestled under the 1500 foot Hermosa Cliffs, across the street from the Weminuche Wilderness, Colorado’s largest wilderness area. 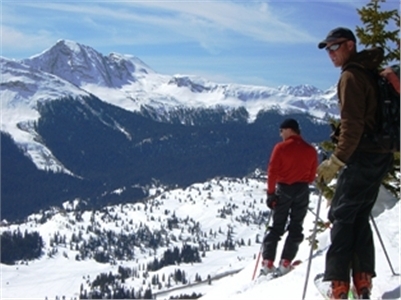 The Silverpick is located on the San Juan Scenic Skyway, US HWY 550, halfway between Durango and Silverton, Colorado and only one mile south of the lifts at Purgatory. Lodge Rooms, Condominiums, and Townhomes are all non-smoking. Sorry, the Silverpick does not accept pets and consequently, you may get to see some wildlife around the Lodge. Don’t feed the bears! On site, you will enjoy the Sow’s Ear restaurant, which is the local’s favorite steak and seafood hangout and features a bar overlooking the exhibition kitchen and lounge with spectacular views of the West Needles Mountains. The dining room has become the “in spot” for neighborhood weddings with outrageous views in three directions and the “Best Steaks on the Mountain”. The Wine List features wines from Colorado, New Mexico and the West Coast at some of the best prices anywhere. Sow’s Ear also offers a Children’s Menu and Bar Menu. The Lodge sits in a mixed aspen and blue spruce forest. There is a gently rolling foot path through the woods and north to Purgatory Village at Durango Mountain Resort. The Lodge has also built several other trails that loop through the forest and under the cliffs and back to the Lodge. All together, the trails make for a combined three and a half miles of relaxation. During the winter, Silverpick will loan you sleds and snowshoes to tour the ‘hood. During the summer, you can buy an old bike to ride while you’re here for $10.00. Inside the Lodge you will find a knowledgeable and polite staff anxious to make your stay comfortable, enjoyable, and hassle free. Interested in renting the entire Silverpick Lodge? Many people do each year. Silverpick’s 13 rooms sleep up to 48 people and the Columbine Room comes equipped with a full kitchen and pots, pans, glassware and china for 60. Silverpick is the perfect spot for groups who want to spend their vacation time away from the maddening crowds and hang out with each other. 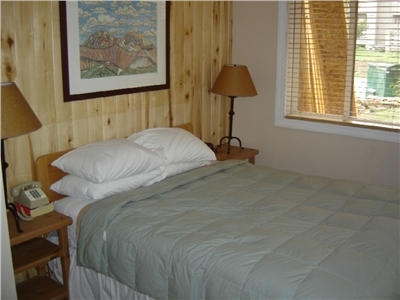 1 Queen Bed with shared deck- each room in the Lodge is unique and is named after one of the surrounding peaks. All of them have feather pillow tops, down comforters, down pillows and a private bathroom. 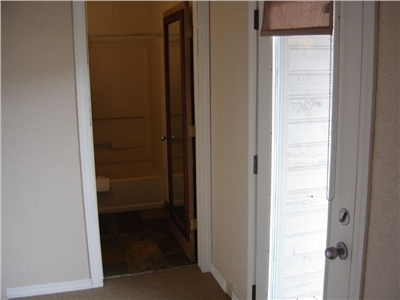 All first floor rooms have hard wood floors, while second floor rooms are carpeted. 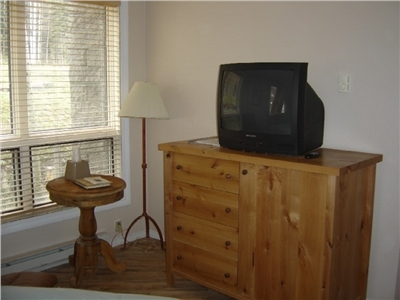 Lodge rooms are furnished with locally handcrafted dressers and end tables. 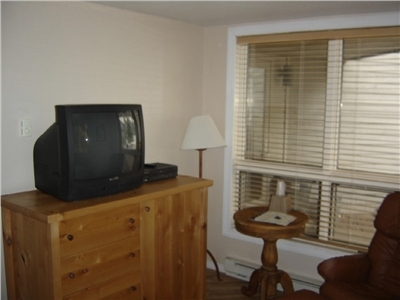 Some of the rooms have decks, fireplaces and flat screen TV's. All the rooms have increadible views and an original drawing of the mountain they are named after. The Lodge also has a 5,000 volume library and a game room with pool table, foos ball and the ever popular Ms. Pacman! The Columbine room, complete with full kitchen and service for sixty people, is available for families and groups who rent the entire Lodge. 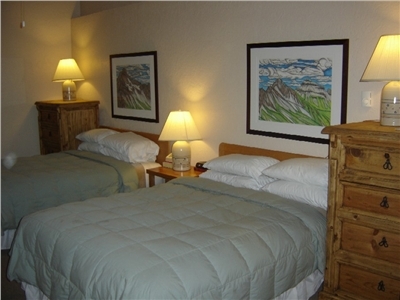 3 Queen beds & Queen pullout - each room in the Lodge is unique and is named after one of the surrounding peaks. All of them have feather pillow tops, down comforters, down pillows and a private bathroom. 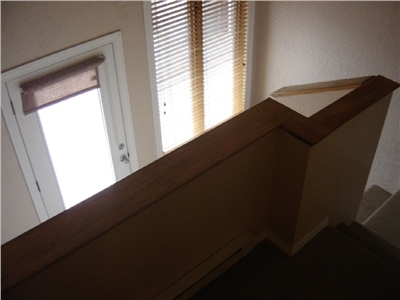 All first floor rooms have hard wood floors, while second floor rooms are carpeted. 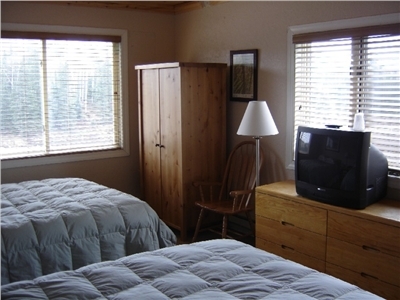 Lodge rooms are furnished with locally handcrafted dressers and end tables. 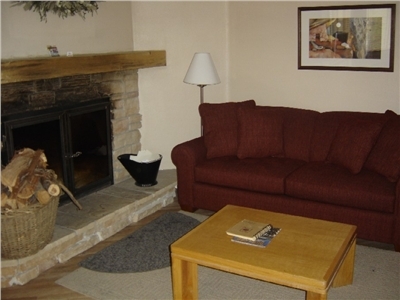 Some of the rooms have decks, fireplaces and flat screen TV's. All the rooms have increadible views and an original drawing of the mountain they are named after. The Lodge also has a 5,000 volume library and a game room with pool table, foos ball and the ever popular Ms. Pacman! The Columbine room, complete with full kitchen and service for sixty people, is available for families and groups who rent the entire Lodge. 1 King with Queen pullout, mini-fridge & microwave - each room in the Lodge is unique and is named after one of the surrounding peaks. All of them have feather pillow tops, down comforters, down pillows and a private bathroom. All first floor rooms have hard wood floors, while second floor rooms are carpeted. 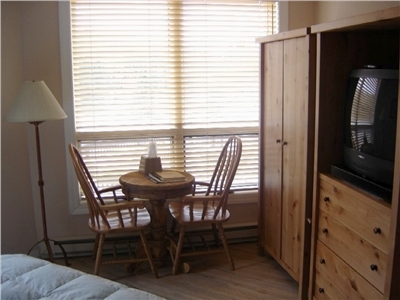 Lodge rooms are furnished with locally handcrafted dressers and end tables. Some of the rooms have decks, fireplaces and flat screen TV's. All the rooms have increadible views and an original drawing of the mountain they are named after. The Lodge also has a 5,000 volume library and a game room with pool table, foos ball and the ever popular Ms. Pacman! 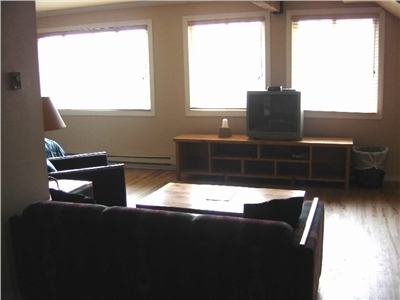 The Columbine room, complete with full kitchen and service for sixty people, is available for families and groups who rent the entire Lodge. 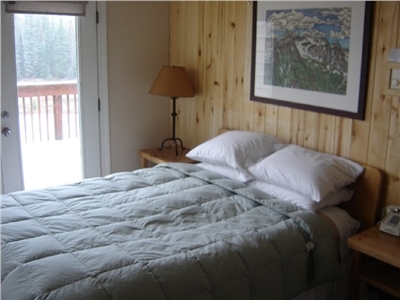 3 Queen beds & shared deck - each room in the Lodge is unique and is named after one of the surrounding peaks. All of them have feather pillow tops, down comforters, down pillows and a private bathroom. 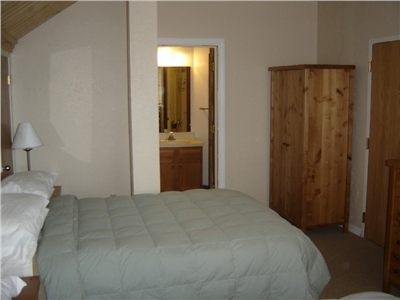 All first floor rooms have hard wood floors, while second floor rooms are carpeted. Lodge rooms are furnished with locally handcrafted dressers and end tables. Some of the rooms have decks, fireplaces and flat screen TV's. All the rooms have increadible views and an original drawing of the mountain they are named after. The Lodge also has a 5,000 volume library and a game room with pool table, foos ball and the ever popular Ms. Pacman! 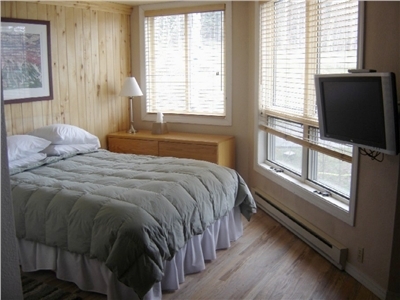 The Columbine room, complete with full kitchen and service for sixty people, is available for families and groups who rent the entire Lodge. 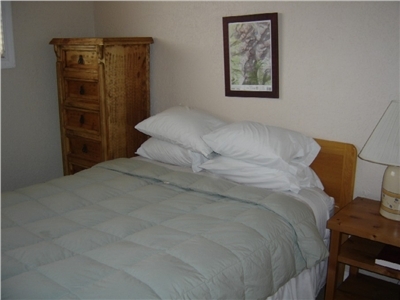 King Bed - each room in the Lodge is unique and is named after one of the surrounding peaks. All of them have feather pillow tops, down comforters, down pillows and a private bathroom. All first floor rooms have hard wood floors, while second floor rooms are carpeted. 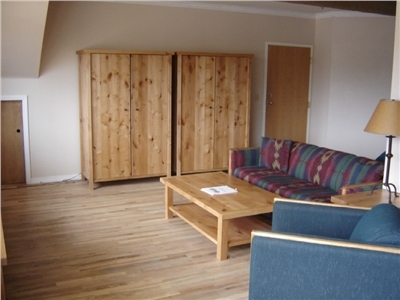 Lodge rooms are furnished with locally handcrafted dressers and end tables. Some of the rooms have decks, fireplaces and flat screen TV's. All the rooms have increadible views and an original drawing of the mountain they are named after. The Lodge also has a 5,000 volume library and a game room with pool table, foos ball and the ever popular Ms. Pacman! 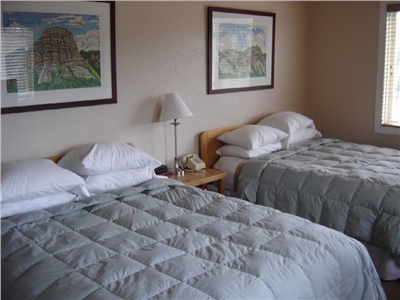 The Columbine room, complete with full kitchen and service for sixty people, is available for families and groups who rent the entire Lodge. 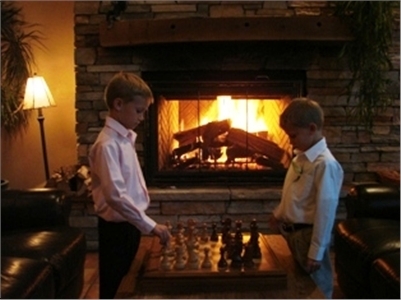 1 Queen & Queen pullout with fireplace - each room in the Lodge is unique and is named after one of the surrounding peaks. All of them have feather pillow tops, down comforters, down pillows and a private bathroom. All first floor rooms have hard wood floors, while second floor rooms are carpeted. 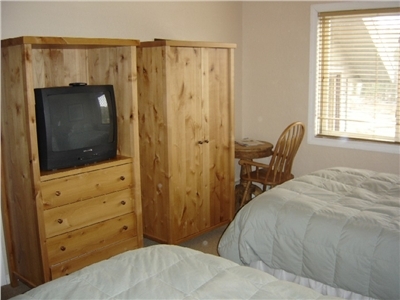 Lodge rooms are furnished with locally handcrafted dressers and end tables. Some of the rooms have decks, fireplaces and flat screen TV's. All the rooms have increadible views and an original drawing of the mountain they are named after. The Lodge also has a 5,000 volume library and a game room with pool table, foos ball and the ever popular Ms. Pacman! 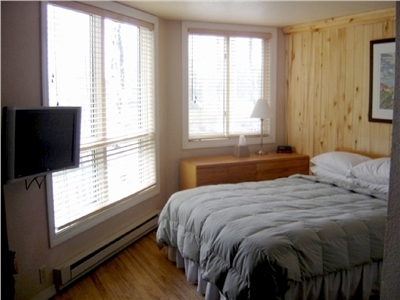 The Columbine room, complete with full kitchen and service for sixty people, is available for families and groups who rent the entire Lodge. 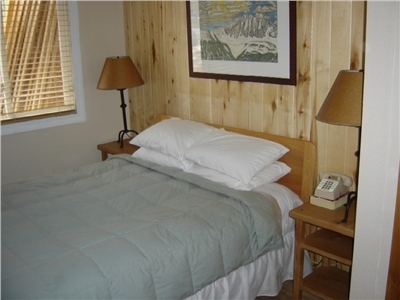 1 Queen Bed - each room in the Lodge is unique and is named after one of the surrounding peaks. All of them have feather pillow tops, down comforters, down pillows and a private bathroom. All first floor rooms have hard wood floors, while second floor rooms are carpeted. 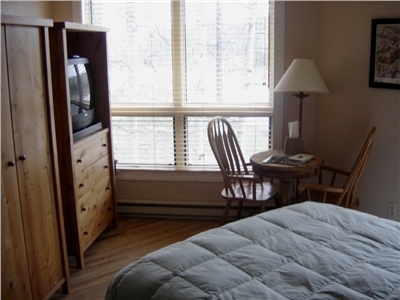 Lodge rooms are furnished with locally handcrafted dressers and end tables. Some of the rooms have decks, fireplaces and flat screen TV's. All the rooms have increadible views and an original drawing of the mountain they are named after. The Lodge also has a 5,000 volume library and a game room with pool table, foos ball and the ever popular Ms. Pacman! The Columbine room, complete with full kitchen and service for sixty people, is available for families and groups who rent the entire Lodge. 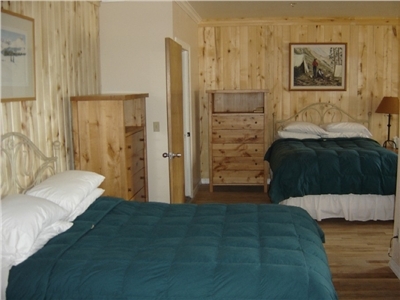 2 Queen Beds - each room in the Lodge is unique and is named after one of the surrounding peaks. All of them have feather pillow tops, down comforters, down pillows and a private bathroom. All first floor rooms have hard wood floors, while second floor rooms are carpeted. 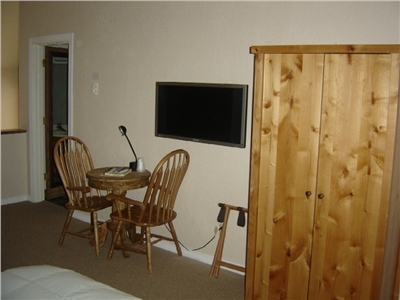 Lodge rooms are furnished with locally handcrafted dressers and end tables. Some of the rooms have decks, fireplaces and flat screen TV's. All the rooms have increadible views and an original drawing of the mountain they are named after. The Lodge also has a 5,000 volume library and a game room with pool table, foos ball and the ever popular Ms. Pacman! 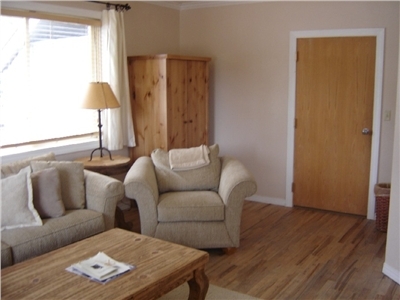 The Columbine room, complete with full kitchen and service for sixty people, is available for families and groups who rent the entire Lodge. Rent the entire Silverpick Lodge and sleep up to 48 of your nearest and dearest under one roof. 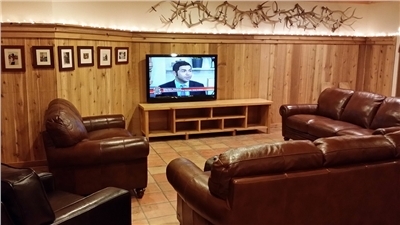 The Lodge is a great place to hang with your friends and loved ones. There are 13 sleeping rooms 17 bathroms, 20 beds, 4 pullout couches, 3 decks and 2 private fireplaces. There's the lobby with leather couches and massive fireplace; game room with free pool and foos; spa with sauna, steam room, massage room and two hot tubs; library with over 5,000 books, free Wi Fi; laundromat, free shuttle to the ski area, coffee and bagels for breakfast and best of all there's the Columbine Room. 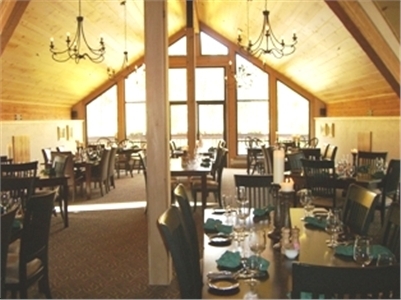 The Columbine Room is a 1200 square foot multi purpose room located on the ground floor of the Lodge. 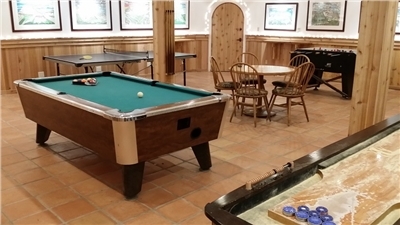 It is adjacent to the game room and just outside the door is a patio and fire pit overlooking the Needles Mountians. The Columbine Room comes equipped with a kitchen fully stocked with all the tables, chairs, pots, pans, silverware, plates, glasses and utensils you'll need for 60 people. There are 2 refrigerators, 2 stoves, 2 dishwashers, and a kegerator! And if you want to have a BBQ there are 2 grills for use outside on the patio. 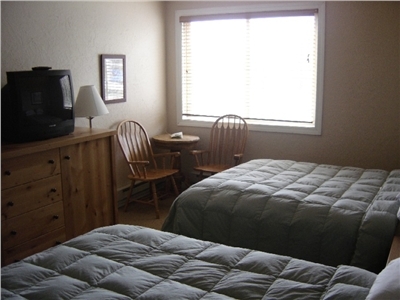 When you Rent the Lodge, you get exclusive use of the Columbine Room to do with as you please. Some folks have had dances, some folks have prayer meetings, some have had formal dinners and some have used it as a romper room. It's all up to you. You can bring your own food and prepare your own meals or else the Sow's Ear can cater a BBQ or buffet. We will happy to assist you with event planning for your group and direct you to the most popular attractions and events in the area. The Lodge rents for $1200 to $2000 per night depending on the season. That's as little as $25 per person! 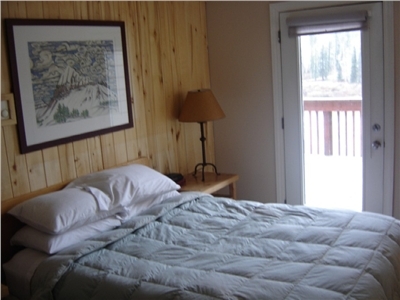 2 Queen Beds & shared deck - each room in the Lodge is unique and is named after one of the surrounding peaks. All of them have feather pillow tops, down comforters, down pillows and a private bathroom. 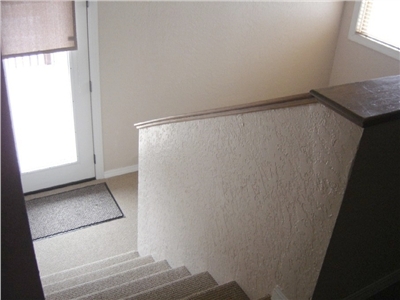 All first floor rooms have hard wood floors, while second floor rooms are carpeted. 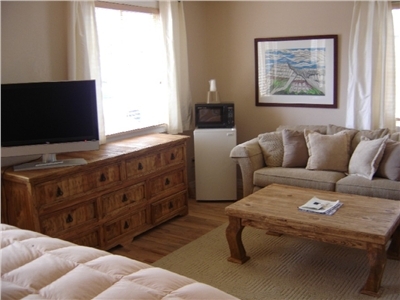 Lodge rooms are furnished with locally handcrafted dressers and end tables. 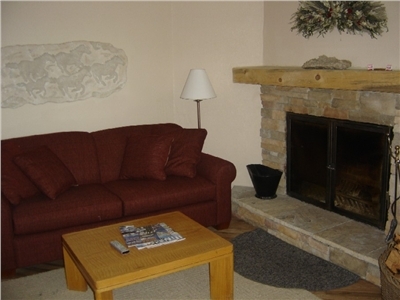 Some of the rooms have decks, fireplaces and flat screen TV's. All the rooms have increadible views and an original drawing of the mountain they are named after. The Lodge also has a 5,000 volume library and a game room with pool table, foos ball and the ever popular Ms. Pacman! 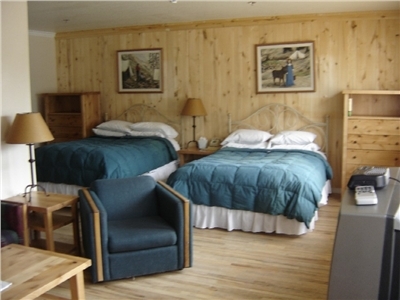 The Columbine room, complete with full kitchen and service for sixty people, is available for families and groups who rent the entire Lodge. 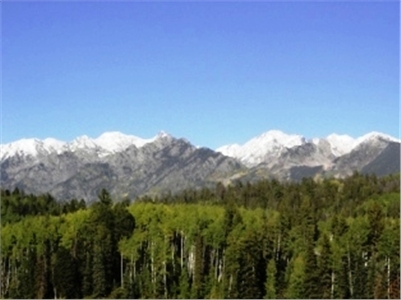 They are easy to find and are located twenty-four miles North of Durango, twenty-six miles South of Silverton, and just one mile South of Purgatory Ski Resort on US Hwy 550. From Durango take US 550 North about 24 miles. At about 22 miles you crest the hill and begin a short decent to the Fina gas station on the left.They are located one mile pas the Fina, also on the left at mile marker 48. From the North, drive south about 25 miles past Silverton on US 550 to the Purgatory Ski Resort on the right. They are located one mile past the ski area on 550, also on the right of mile marker 48. Cancellations: 90% of your deposit will be refunded if you cancel prior to 14 days of your scheduled arrival. 50% of your deposit will be refunded if you cancel within 14 days of your scheduled arrival. Cancellations: 50% of your deposit will be refunded if you cancel up to one month prior to your scheduled arrival. You will forfeit your deposit if you cancel within one month of your arrival. Deposit	| Deposit: 1/2 total lodging cost due at time of booking. Final Payment due 30 days prior to arrival. Check In	| 4:00 P.M. Check Out	| 10:00 A.M.
Other	| Cancellation - NIGHTLY RENTALS: Cancellations: 90% of your deposit will be refunded if you cancel prior to 14 days of your scheduled arrival. 50% of your deposit will be refunded if you cancel within 14 days of your scheduled arrival. WEEKLY RENTALS: Cancellations: 50% of your deposit will be refunded if you cancel up to one month prior to your scheduled arrival. You will forfeit your deposit if you cancel within one month of your arrival. HOLIDAYS: Xmas & Spring Break Cancellations: 50% of your deposit will be refunded if you cancel up to one month prior to your scheduled arrival. You will forfeit your deposit if you cancel within one month of your arrival.